America loves innovation and the can-do spirit that made this country what it is-a world leader in self-government, industry and technology, and pop culture. Everything about America has at one point or another been an experiment and a leap of faith. And one such experiment-upon which all others depend for success-is the U.S. Patent System. Why Has America Stopped Inventing? takes a close look at why this experiment appears to be failing, at why America has all but stopped inventing. Our belief that we are the most innovative people on earth is mistaken. The hard cold numbers suggest that American innovators are losing their edge. Statistics show that today we invent less than half of what our counterparts did a century and a half ago. While it’s true that the world’s cities are filled with American technology and gadgets like smart phones and athletic shoes, we’ve been lulled into thinking that we remain as inventive as ever, if not more so. But that’s just not so. Look around: Where are the groundbreaking inventions comparable to those from the Industrial Revolution? It’s unbelievable (and unforgivable) that we’ve been using the same mode of transportation for over a century. And why are we still using coal and gasoline as our major energy sources, choking our cities with pollutants? We’ve evolved from the steam engine, the automobile and the airplane to what? Why aren’t we driving automobiles that run on hydrogen extracted from ordinary tap water? Why are we giving a trillion dollars every year to hostile foreign nations for imported oil when we have the inventive talent in America to solve the nation’s energy crisis? We don’t have these desperately needed technologies because regular Americans have given up on inventing. 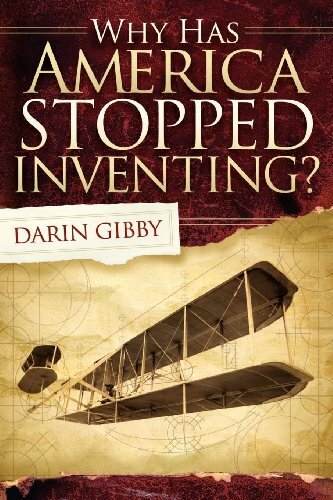 Their innovative spirit has been snuffed out…and Why Has America Stopped Inventing? explains why by comparing the experiences of America’s most successful 19th century inventors with those of today. To do so, the book follows Jefferson refusing to waste any more weekends examining patent applications, Whitney being robbed of his fortune while the South’s wealth exploded, the patent models that kept British soldiers from burning Washington’s last-standing federal building, the formation of Lincoln’s cabinet, and Selden crippling the entire U.S. Auto Industry. It also tells the story of the Wright brother’s airplane monopoly, the Colt revolver’s role in the Mexican American War, the Sewing Machine wars, the last six months of Daniel Webster’s life, and the controversy behind the Bell telephone patent.